1. In small bowl, combine coleslaw mix, green onions, lemon juice and caraway seeds; toss to combine. 2. Spray 1 side of bread slices with cooking spray. Place 4 bread slices, sprayed side down, on work surface. 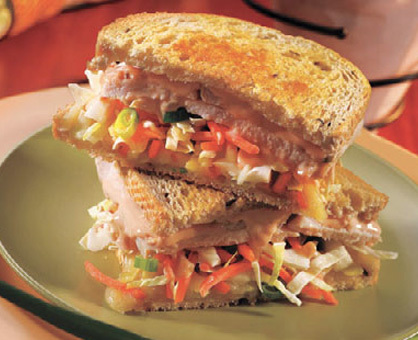 On each slice of bread, layer 1 slice cheese, 3/4 cup coleslaw mixture, 3/4 cup turkey and 1 tablespoon dressing. Place remaining bread slices, sprayed side up, over fillings. 3. Preheat griddle over medium heat. Place sandwiches on griddle and cook 6 to 8 minutes or until bread is golden and cheese melts, turning sandwiches halfway through cooking. Cut each sandwich in half and serve with Lite Seasoned Oven Fries. With cancer-preventing characteristics, shredded cabbage is a healthy alternative to the sauerkraut traditionally used in Reuben sandwiches.